Breaking Out of Traditional Holiday Looks! Hello to all my followers and Fashionsta readers! 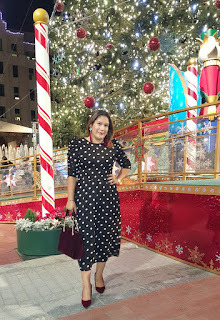 This year, I will be doing something different for Holiday outfit ideas and breaking a bit away from full-blown traditional colors and patterns! I won't say too much now because I want to surprise you all and see what you think and if its something that you would and could dare to do! Stay tuned, because after Thanksgiving break, I will be posting and uploading my 2017 holiday outfit ideas and looks! Along with posting the outfit photos, I will also be including where I bought them and how much! Because I know that if you are like me, a stay-at-home mom of more than 1 child, we like to shop on a budget! So make sure you come back to my blog beginning week after Thanksgiving for some outfit inspo and ideas! As always, happy shopping and hope to see you guys stop by my blog again after the Thanksgiving holiday! Street Style Fall Looks Coming Soon! Hello November! 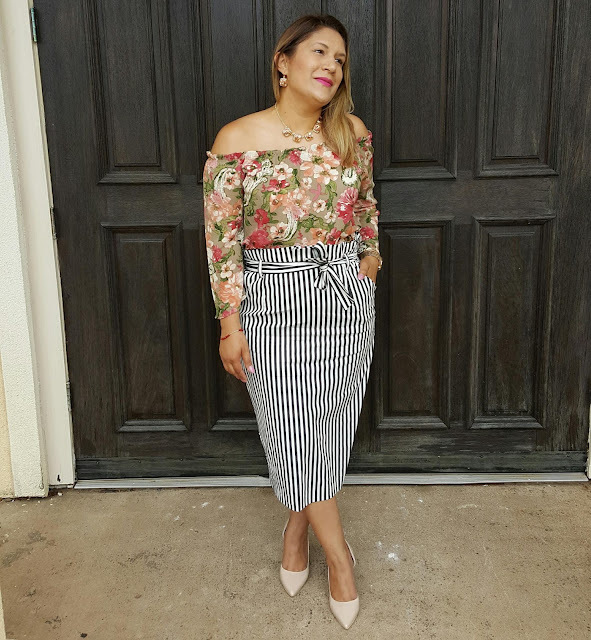 With Fall here and sweater weather definitely here, I am ready to put some looks together for my Fashionista Babes that will not cost a fortune! Recently, I've had some very good clearance finds at some of my most frequented stores, resale shops, and thrift stores! This season I will be all about the boots, over sized sweaters, and dresses with pretty coats! Make sure to come back and read all about my finds as well as follow my Instagram account for outfit photos! Always remember, you can look fabulous and like a million bucks without spending what you don't have! Or spending way too much! Some of the outfits I will post in the next week along with details are perfect for this Season! Target Clearance Haul! Style Clearance Deals Into Fall! So recently I took a trip to Target! Don't we fashionista's love Target Hauls?! Especially when there are major clearance deals on brands you love! Like the brand Who What Wear! So I spent $100 and took home three skirts, their plaid pants, two blouses, two dresses and another two blouses and two skirts from a different brand, but there at Target! The outfit below was my favorite to style! The Who What Wear printed dress with detailed cuff sleeves was perfect with wine accessories! And it was on clearance for just $18! You cannot beat that deal! The velvet pumps are from a few seasons ago from Old Navy and the Apt.9 velvet purse was originally $59 but after my rewards and coupons it was $26.10!!! 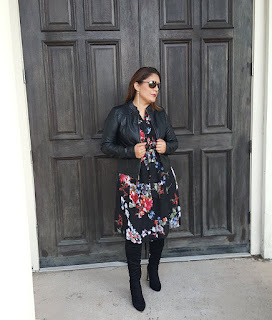 Time For Fall Florals, Pretty Coats and Jackets, and Boots! Finally it's not so hot in Texas! It's still warm, but not as bad! And with cooler weather comes floral dresses, pretty coats and motto jackets, boots of all styles! Today's look has an amazing story behind It! So, I received my Birthday email from one of my favorite stores, Kohl's, with a $10off any item, an email with $10 yes2you reward, and I had $10 Kohl's cash from a previous purchase! And what do I hunt for? A little black faux leather motto jacket on sale for $39.99! And I was able to use all three on the jacket, making it $9.99!!! Yassss! The floral midi dress was $14.99 at my local Ross Dress for Less store! And the knee high boots I've had from a clearance deal at Cato Fashions last Fall! Looking Fab for Less is what I love to do! Happy shopping Fashionista's! Wearing The Most Of My Summer Outfits Before Fall Arrives! Happy start to another week! Is it me or does anyone else think that this year 2017 has gone too fast! We are just a week away from welcoming Fall! With that said, I just wanted to let you all know, that I will be taking advantage of this last week of Summer 2017 by posting Summer outfits that will inspire you! I have lots of Fall 2017 looks lined up and ready to wear which I will be posting on my Instagram and Twitter beginning next week, so please check those sites out so you can get inspired and have ideas for Fall 2017 that are budget friendly! Thanks so much for your support and love! As always, if you love the chic and street style looks, please visit my Instagram and Twitter for the latest looks! Pre-Fall Looks That Won't Break Your Bank! Hello! Hope my fashionista friends, bloggers, and followers are doing well! This year has flown by so fast! Fall is upon us and I am so ready for the many exciting patterns and colors! Some of my favorite stores like JcPenney, Target, and Kohls have many great deals right now and awesome Fall collection pieces! It also pays to be a reward member at stores that allow you to accumulate points for every visit you spend certain amounts on! 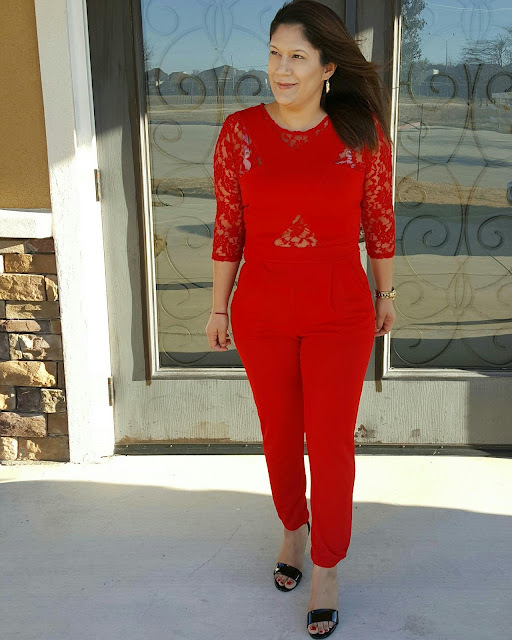 The first look on today's post combines several of the stores that I shop at, including Macy's, Target, JcPenney, and Old Navy. I paired the Who What Wear plaid front-tie mini with a classic white button up with bell sleeves and accessorized it with burgundy velvet pumps and burgundy ball drop statement earrings! The skirt was under $30 at Target and the rest of my outfit are older season purchases at JcPenney, Old Navy, and Macy's. 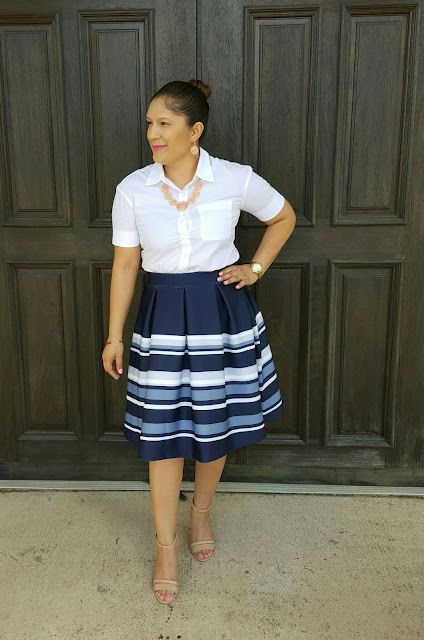 Styling Summer Pieces Into Fall! Hello my Fashionista friends! I do have to say that I am a bit sad that the blog has not let me upload the photos to go with the post! I have emailed and messaged the proper department for blog spot and I have not seen any responses or results! But while I do await to hear, let's talk about Fall! What is your favorite essential piece for Fall, what colors or patterns are you most excited about?! 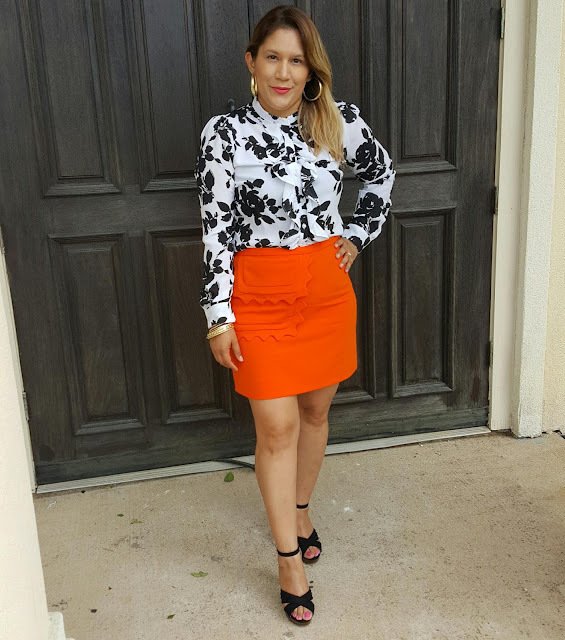 I can tell you that for me, there are always classic pieces which I always wear Fall after Fall (until they give out on me) and some of those are, the classic black blazer, classic denim, classic black pumps, and classic white button down shirts! As Fall approaches, I start to envision looks with blazers, jeans, and even Summer pieces that are easy to transition! The look with the printed blazer and jeans was a deal! The blazer was $4.99! Yes, clearance for just $4.99 at my local Cato Fashion's! The ankle jeans were $12.49 at my local Rue21, and the peep-toe mules were also clearance at my local Cato Fashion's just under $10! The look with the color block jumpsuit is an easy Summer to Fall transition! 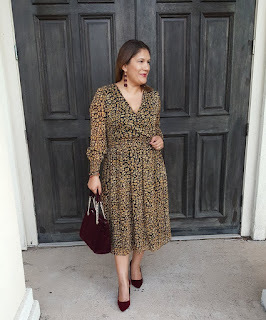 The burgundy blazer I've had for a few season's, so I paired it with the strapless Summer jumpsuit which I found for under $17 at my local Ross Dress For Less store! I'm always on the hunt for deals on clothing I will be able to wear over and over! I can't wait to share more on my blog and also my Instagram and Twitter for you all! Summer Deals With Pretty Tops and Shorts! Texas Summer heat is dry and usually triple digits! 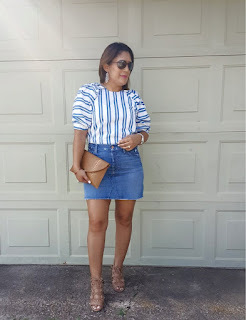 So this Summer, I have found so many cute shorts and tops that are perfect for this Summer heat!Lately I have found great clearance deals at Target, Dillards, and Macy's Backstage!Even in my mid 30's, I still find shorts that I can wear and that make me feel pretty! Get Your S/S Black and Whites Ready! Here's My Take On It! So, who says black and white can't be Spring or Summer?!! How do you bring your black and white wardrobe to life during Spring and Summer?? I pair them with bolds, brights, pretty pastels, and matching accessories!Never be afraid to rock black and white in Spring or Summer! Better yet in any Season! 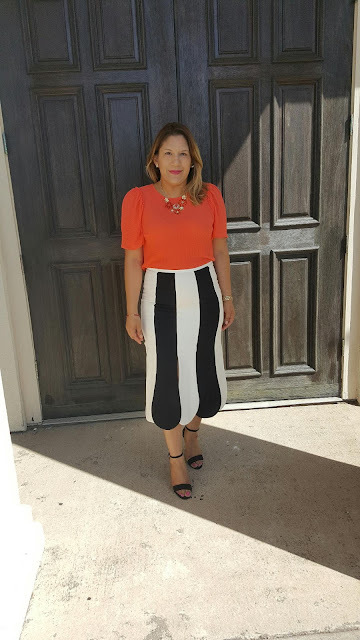 Here's a look I put together with coral!The Victoria Beckham striped skirt was my Target clearance find for $19!The Coral Worthington top I bought a few months ago at JcPenney!And the Metaphor ankle strap heels are from Sears!This look is ready for Spring or Summer! Have fun with your closet! Skirt, Dresses, and More Skirts! My SS17 Looks! It Pays to Be a Rewards Member! Spring is here! This means pretty colors, patterns, cuts, and styles! 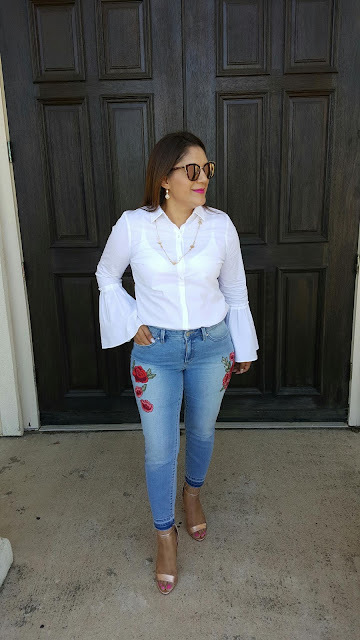 We also get to wear pretty sandals, open toe heels, and wedges!On a trip to some shopping store outlets last month, I went into the Bloomingdale's Outlet and couldn't resist passing on the pale pink puffy sleeves front bowtie blouse! Regular $70 but I paid $29!!! Just a little over fifty percent off! You see, when it comes to clothing, I not only love to shop clearance, sales, and even resale, but I also don't mind how many seasons ago clothes are! As long as it is season color appropriate, I will wear it and I will rock it! So never be afraid to wear older season clothing! What I am looking forward to as Spring and summer approach, is being able to let my feet be free! I love being barefoot, so tis the Season for open toe shoes, skirts, and shorts!I am welcoming March with track pants, strappy block heels, and white! 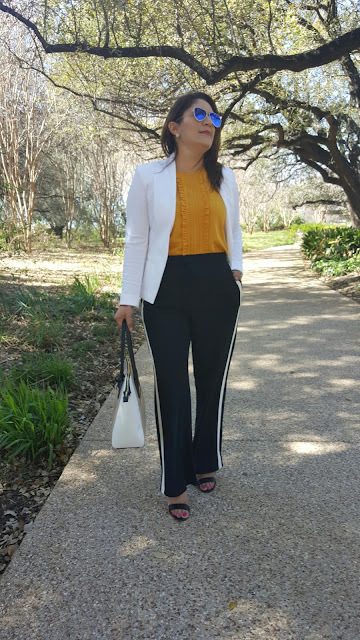 I scored on the Merona blazer at Target for just $17.99, the track pants were regular price $29.99, they are from the Who What Where Collection! And the shoes and blouse I've had!Who said track pants can't be chic and street style?!! 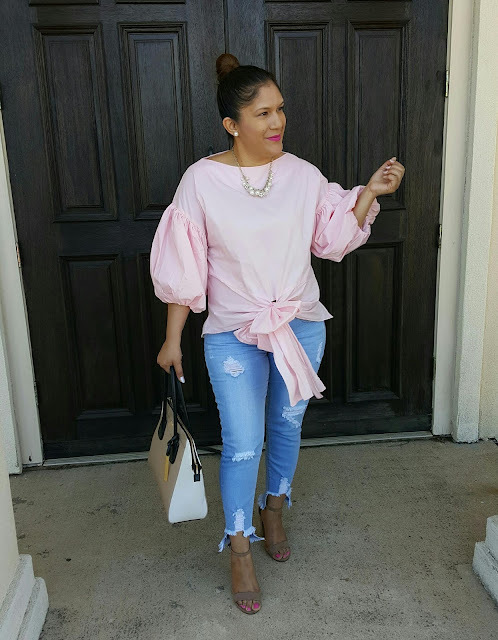 Well this Fashion Mom just did! Lots Of Bell Sleeves Coming This Spring! Happy Valentine's Day! 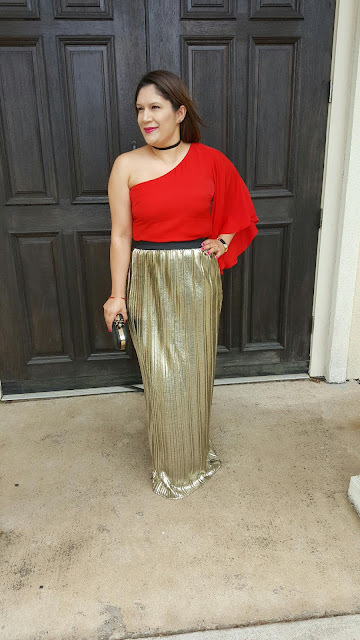 My 2017 VDay Look! What I've Put Together For My Fashionistas For VDay!